Mazda has announced that a special edition of the MX-5, called Icon, will launch at the 2016 Goodwood Festival of Speed. Based on the 1.5-litre 131PS SE-L Nav version of the MX-5, it’s the first special edition roadster of this generation, but the fourth to wear the Icon badge. It costs £20,995. That makes it £1150 extra, but for that you get stuff like contrasting red metallic finished mirrors, a rear spoiler, a unique front skirt, 16-inch gunmetal grey alloys. Standard kit includes black leather seats, rear parking sensors, and automatic lights and wipers. Available to order now, it’s actually the fourth MX-5 Icon in the model’s history, the first three having come in 2000, 2005 and 2007, although as this one is limited to just 600 cars it’s set to be the rarest ever; Mazda produced 750 2000-model Icons, 1563 for the 2005 model year and 1,250 of the 2007 car. 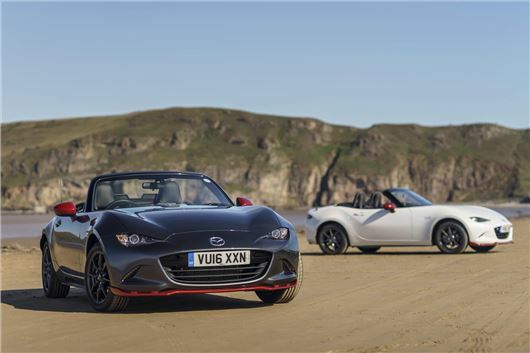 “We are delighted that UK MX-5 fans will get to see both the Icon special edition and the all-new Mazda MX-5 RF at the Goodwood Festival of Speed”, said Mazda UK MD Jeremy Thomson. “With over 120,000 sales since its launch in 1990, the UK has played a huge part in the MX-5 success story and the Icon follows a long tradition of special edition MX-5s that allow customers to have a stand out vehicle which is truly affordable,” he added. The Goodwood Festival of Speed takes place 23-26 June 2016.